Trump's Emphatic Africa Strategy - Primacy or Partnership? Defining the Trump Africa Strategy - Primacy or Partnership? U.S., China Plus Russia in Africa - Will It Mean a 'Best Deal' for Africans? 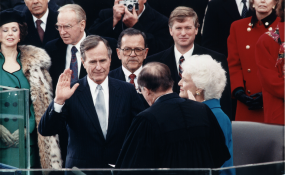 Chief Justice William Rehnquist administering the oath of office to President George H. W. Bush during Inaugural ceremonies at the United States Capitol. January 20, 1989. "I have been pleased today to welcome to the White House Mrs. Albertina Sisulu, of Soweto, South Africa... She personifies the struggle for human rights and human dignity, and her presence here is an inspiration to us all." In these words, former President George H.W. Bush - who died in Houston, Texas late on Friday - signalled to South Africans in the first months of his term in 1989 that he was willing to press more vigorously for an end to apartheid than President Ronald Reagan had in the previous eight years. Reagan was an implacable opponent of sanctions against apartheid. He repeatedly welcomed Mangosuthu Buthelezi, a strong South African opponent of sanctions, to the White House, and after his one meeting with then Bishop Desmond Tutu, who equally strongly backed sanctions, the president parroted the apartheid government's line that "if apartheid ended now there still would be civil strife between the Black tribes." Moreover, Reagan's director of Central Intelligence, William J. Casey, saw white South Africa as a bulwark against communism. Chester Crocker, Reagan's assistant secretary of state for Africa, said many years later that the president had "a tin ear on issues of race". But in an intense struggle between Reagan's administration and Congress, George H.W. Bush - serving as Reagan's vice-president - and chief of staff James Baker favoured making modest concessions to congressional advocates of sanctions. Ultimately, Congress defeated the administration and imposed sanctions with enough support to override Reagan's subsequent veto of the legislation. As Bush was about to succeed Reagan, David Boren, a Democratic senator and old Bush family friend, gave the president-elect a vivid briefing on a visit to South Africa during which South Africa's president, P.W. Botha had abused Boren and a fellow senator. In contrast, Boren spoke warmly of Albertina Sisulu, a co-president of the United Democratic Front (UDF), and urged that she be invited to the White House. Three months after Bush's inauguration in 1989, James Baker - now Bush's secretary of state - wrote to the new president that early contact with "credible leaders" in South Africa was vital, and formally proposed that the invitation be issued. When she visited with a UDF delegation in June of that year, Bush lauded Sisulu for her "life of sacrifice for the betterment of all South Africans" and told her that "we believe strongly that apartheid is wrong and that it must end". He added: "We want to see the creation of a nonracial and democratic South Africa as a result of negotiations among legitimate representatives of all of South Africa's people. We support the beginning of a process leading to a peaceful transition to democracy." In the same month, British Prime Minister Margaret Thatcher, the last Western leader to hold out against sanctions, told F.W. de Klerk, who was waiting in the wings to take over from Botha, that the game was up. She could no longer hold the line and De Klerk must release Mandela when he came into office. Two months later, a five-year-long insurrection mounted largely by young people on the ground in South Africa was followed by a non-violent "defiance campaign" led by UDF, civil society and church leaders. Apartheid security forces tried to crush the campaign but in the face of the mounting pressure from the streets and diplomatic pressure from abroad, De Klerk - by now acting president - was forced to back down. He told Botha's generals they had to allow public demonstrations to go ahead. Huge protest marches swept the country and within a month, Walter Sisulu - Nelson Mandela's political mentor and Albertina's husband - was released, along with the other prisoners jailed for life with Mandela. At the same time, peaceful protests in Leipzig and elsewhere in East Germany precipitated the fall of the Berlin Wall. White South Africa's usefulness to Western anti-communists came to an end, Mandela was released four months later, negotiations for democracy began, and almost a year to the day after Bush had welcomed Albertina Sisulu, he was on the South Lawn of the White House, welcoming Mandela.